Pride doesn’t always go before, during, or even after a fall. Ten thousand years ago, the most powerful civilization on Azeroth was the Kaldorei Empire, ruled by Queen Azshara. The majority of ancient Kalimdor was theirs — the parts they didn’t control were far enough away from the Well of Eternity that they simply didn’t matter. The Highborne were skilled magicians who ruled the Empire on Azshara’s behalf, and they were very proud. They were so proud that they nearly destroyed the world. It was the Highborne Xavius who caught the attention of Sargeras during his probe of the Well of Eternity, and it was the Highborne who served Xavius and Azshara when the Queen chose to ally with the Burning Legion and bring them to Azeroth. Those Highborne who remained loyal to Azshara — the majority of their caste of magicians — served her faithfully all throughout the War of the Ancients while the Kaldorei and the rest of Azeroth fought to preserve themselves from destruction. When Malfurion Stormrage caused the Well of Eternity to implode, and ancient Kalimdor sundered into the continents and islands of modern Azeroth, the Highborne faced destruction. Those that had turned against Azshara survived, but changed — the modern Sin’dorei, Shaldorei, and Quel’dorei are their descendants. But those that were doomed? 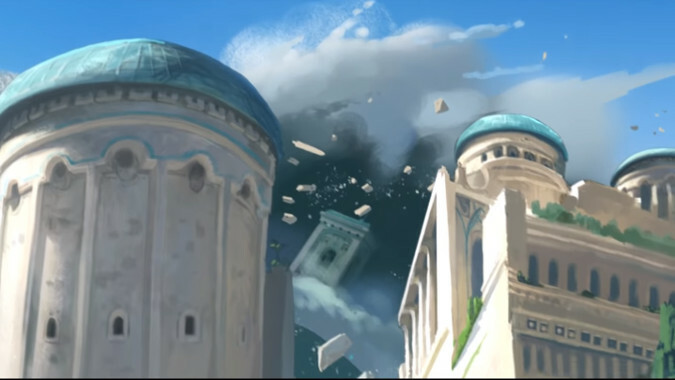 Those that were loyal to Azshara, who saw the wall of water as it swept over their great city of Zin-Azshari? The Highborne who served their Queen faithfully in all things? They too endure. Yet they changed the most of all. The bare facts are at once unremarkable and utterly horrifying when you stop to think about them. The vast majority of Kalimdor was destroyed. The death toll is uncounted. For every piece of land that survived, many more were sunk to the bottom of the ocean. For every survivor, dozens drowned. And no city faced ruin like Zin-Azzshari, the city at the heart of the Kaldorei Empire. Like Suramar, Zin-Azshari was built on the very banks of the Well of Eternity itself, and so when Malfurion caused the Well to implode rather than allowing it to open a portal for Sargeras to walk through onto Azeroth, Zin-Azshari faced the full brunt as the waters roared to the center of the now vanished landmass. Sargeras was a threat to all life everywhere, of course, and we’ve seen how dangerous he is recently with his attack on Silithus. But it’s hard to argue that the destruction of Ancient Kalimdor didn’t seem like the end of the world to the people of Zin-Azshari. 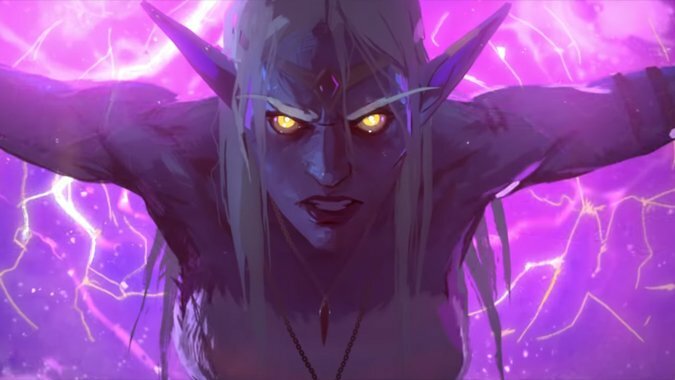 While Suramar had the benefit of an entire order of magi under Elisande — as well as the use of the Pillars of Creation themselves — to create a barrier strong enough to hold back the seawall, all Zin-Azshari had was Azshara herself, as most of her most skilled mages were off serving her will. 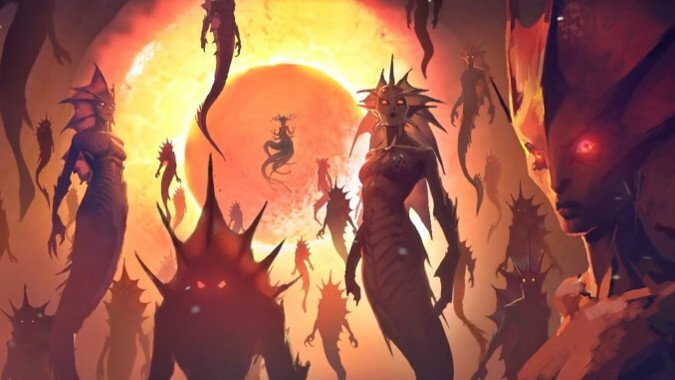 The fact that Azshara nearly stopped the destruction of Zin-Azshari by herself, without the use of the Pillars of Creation, is a terrifying thing. What happened next is even more terrifying. This moment is the genesis of the Naga. Before it, they were a city of the damned, drowning in the tidal wave caused by Malfurion. After it, they were Azshara’s more fully than they had been before — and before, they were hers utterly. Those that were not had already rebelled against her — these were the loyalists, the citizens who had not turned against their beloved Queen, the ones who’d loved her so much they’d renamed the city in her honor. They’d replaced the name Elun’dris, the Eye of Elune, with Zin-Azshari, Glory of Azshara. They loved her. They worshiped her. And now they literally owed her their very existences. Indeed, everything they were was now changed forever, as the Old God made of them the core of the army he’d need to rebuild an empire on Azeroth… an empire that would be built and ruled by Azshara. While not utterly silent, the Naga were fairly quiet for the next ten thousand years. They still acted from time to time — the ancient Drust told stories of the Naga attacking them, and Naga fought against Vrykul forces in Northrend as recently as 500 years ago, when Azshara imprisoned a Kraken named Leviroth in those frozen seas. The Naga developed a caste society of sorts. 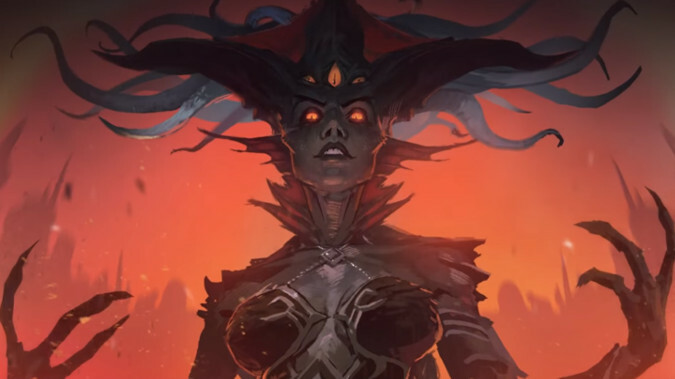 Worship of Queen Azshara is taken as a given, to the point where any who refuse are almost immediately branded heretics and will be dealt with harshly. The Naga have broken up into a tribal structure not seen when they were the Highborne, and it seems likely that despite their being generally long-lived as any other Elves, the Naga society has greatly diverged from that of the Highborne they once were. Some of this might be due to the differences in Naga — Naga women tend to retain more of their intellect and memories and are generally the better sorceresses and priestesses, while Naga males have degenerated further and are more beast-like, with massive fanged heads like giant serpents and larger, more muscular frames. It’s unknown if this is due to N’Zoth’s design for them, if Azshara is behind it, or if it’s just a quirk of the Old God magic that changed them. Some, like lady Vashj, became at least ageless, if not actually immortal. Following the Third War and the return of the Burning Legion to Azeroth, the Naga have been more active. Lady Vashj led her followers to the surface, seemingly at Azshara’s command, to join forces with Illidan Stormrage and serve him. She even accompanied him to Outland and seemingly died in his service — although if Vashj is immortal she might well return. The Naga have been seen in Northrend, in the submerged land of Vashj’ir, on the shores of both Kalimdor and the Eastern Kingdoms, and when the Legion invaded the Broken Shore, the Naga became active in looking for one of the Pillars of Creation, the Tidestone of Golganneth. They are now very active, with a presence in both Kul Tiras and on Zandalar itself, serving their Queen and her plans. Proud to the point of arrogance, fanatically loyal to their Queen, and seemingly capable of fighting on multiple lands at once, the Naga have yet to show their full power. But it seems they will soon.